Do you feel disconnected, low, depressed, separate or detached at times despite lots of tapping? Or perhaps you have clients where you have worked with their conscious memories, but they still don’t seem to make lots of progress. Are you aware that many of these feelings can relate back to a difficult birth experience? With Matrix Birth Reimprinting you can go back to the womb and reimprint your birth experience, which will change your energy levels, mood, and wellbeing in the present. You can also learn to do the same for your clients. This one day speciality workshop is presented by Sharon King, creator of the Matrix Birth Reimprinting (featured in the Hay House book Matrix Reimprinting using EFT) and Matrix Life Purpose protocols. This workshop is for Matrix Reimprinting practitioners who would like to expand on their knowledge of releasing the subconscious memories of conception, time in the womb, birth and our very early years and learn new techniques to facilitate healing for themselves and their clients. EFT and Matrix Reimprinting practitioners who are already using this technique are clearing issues with clients much faster and with amazing results. I wanted to say a belated thank you for a wonderfully inspiring talk and demonstration you gave at the April Supervision day in Studley! Having studied your notes extensively I was presented with an opportunity to work this way yesterday… oh my word, it was wonderful how well and how quickly it worked! Thank you so much for enabling me to have this knowledge – I cannot wait to do it again! I’d already done vast amounts of work with Matrix Reimprinting when Sharon did a Birth Reimprinting session with me. However, the session was very profound. Before the session I asked my mother about my birth and she shared some details that she had not previously shared with me. Suddenly a number of things made a lot more sense! Thanks to Sharon’s technique we were able to reimprint my time in the womb. Having been born in the early 70s, my time in the womb had been fairly toxic with alcohol and cigarettes being consumed. We were able to go back and clear some of this toxicity, and clear some other issues around the birth. I experienced this on a very profound level, and felt a greater sense of connection following the experience. Thank you Sharon. “Earlier this year I had booked a private EFT session with Heather Eden – one of the issues was my difficult relationship with my mom. 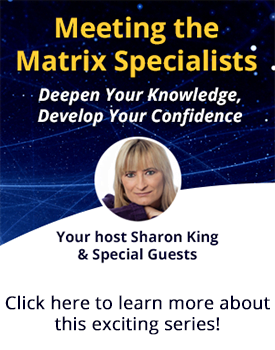 After some EFT, Heather mentioned that she had just spent a day with Sharon and they looked at Matrix Birth Reimprinting and would I be prepared to try it. If I am totally honest I was very skeptical, but trusted Heather and thought what do I have to lose?. during the weekend at Studley Castle – I took the opportunity to once and for all get my relationship back on track with my mom. So I decided to work with Heather again, as she was already aware of the issues. We went back to a couple of milestones in my childhood and worked on some Matrix Reimprinting and then I knew I was ready to be re-birthed. It was 10x stronger than the first re-birth and this time I knew it was complete. After my re-birth, I spoke to my mom on the phone and we talked about my birth and the whole weekend. She then said the 3 words I so needed to hear ” I love you”. Since then, things have been great, I love my mom so much and do not blame her for anything and I love her so much. Thank you so much Sharon from the bottom of my heart. Thanks Sharon for a fantastic day at Studley Castle recently. Your workshop on EFT and Matrix Birth Reimprinting was so interesting and thought provoking – I am so blown away with this technique that I feel I should specialise – up to now I have not been drawn to a specialist area but this is for me, l absolutely love it! What was amazing was the way that it cleared my own ‘being always late’ issue.. at least now if I am running late I don’t worry about it! I recommend this to everyone whatever age…Well done and you go for it girl!